The operations, and the underlying value, of many closely held companies may be affected disproportionately by dependence on one or two key individuals. This dependence, typically referred to as “key person risk,” is recognized within the valuation profession. This key person risk is often accounted for in the form of a valuation discount applied to the company’s overall business value. Valuation analysts providing services in a marital dissolution setting often face the challenge of performing the necessary diligence to (1) identify whether a company is exposed to key person risk and (2) assess the impact of key person risk on the closely held business valuation. The valuation of “personal” goodwill and “corporate” goodwill is often a disputed issue in a marital dissolution matter. Depending on the prevailing state statute, the distinction between these two types of goodwill may play an important role in determining which assets are marital property and which assets are separate property. Valuation analysts can provide significant guidance and support to family law counsel with regard to identifying and quantifying professional goodwill and business goodwill within a family law context. Similarly, family law counsel can provide invaluable legal guidance to the analyst regarding the relevant statutory authority and judicial precedent within the subject family law jurisdiction. There are many capable and qualified financial analysts throughout the country who are able to serve effectively as financial experts in a marital dissolution setting. Regularly, courts issue decisions that serve as a reminder that qualifications and experience are necessary for financial experts to produce supportable expert opinions. However, such expert opinions still may not persuade the court if they fail, in any respect, the test of reasonableness. Typically, income taxes result in a reduction in the net earnings and cash flow resulting from business operations. Further, income taxes typically reduce the net proceeds realized from the sale of a business or a business interest. Currently, an entity can be legally structured in a variety of ways, with the various structures resulting in different income tax treatment. The recognition and understanding by a valuation analyst of the variety of legal operating structures available to companies, and related income tax implications, will enable the analyst to develop more complete valuation analyses and conclusions. Such considerations are relevant when providing valuation services in a marital dissolution context. Business valuation in a divorce setting requires a broad understanding of generally accepted business valuation theory and practice. This discussion addresses several considerations regarding a business valuation completed in a divorce setting, including (1) the development of the engagement specifics, (2) the relevant standards of value, and (3) the generally accepted standard valuation approaches and methods. Further, topics that often are the subject of significant disagreement in a divorce valuation setting are considered, including (1) the analysis of controlling versus noncontrolling and marketable versus nonmarketable ownership interests, (2) the impact of ownership agreements and prior transactions on the valuation process, and (3) intangible assets (i.e., “goodwill”). Valuation Practices and Procedures Insights Estimating the risk-adjusted discount rate or direct capitalization rate are among the more challenging aspects of developing a reasonable business value indication when using the income approach to valuation. Generally accepted business valuation practice recognizes multiple methods for the development of discount rates and capitalization rates. Analysts that (1) implement generally accepted practice, (2) rely on credible sources for rate of return information, and (3) provide circumstance-specific support and rationale when developing discount and capitalization rates will be better positioned to defend their business value conclusions. The review of another valuation analyst’s family-law-related work product requires an understanding of generally accepted valuation practice, including relevant valuation standards and relevant judicial precedents. This discussion addresses (1) applicable standards to consider when completing an appraisal review, (2) the applicable standards to follow in a valuation engagement or a calculation engagement, and (3) some common inconsistencies or errors identified during an appraisal review. Valuation Practices and Procedures Insights The valuation of a closely held business or security typically involves analyzing historical financial statements to estimate a normalized level of expected cash flow. Analysts generally adjust certain expenses to facilitate comparison to similar publicly traded companies and to provide a picture of the normal operations of the subject company. The following discussion addresses the application of these income normalization adjustments. Valuation Practices and Procedures Insights In a marital dissolution context, legal counsel hired by each party often will require the services of a valuation analyst to assist with certain property settlement aspects of the divorce. Specifically, an analyst may be retained to provide an independent opinion of the value of certain marital property, such as a closely held business interest, included in a marital estate. Typically based on cost considerations, legal counsel frequently find themselves considering between two scopes of service that an analyst can provide in a divorce setting: (1) a calculation engagement or (2) a valuation engagement. 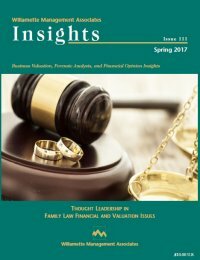 This discussion highlights the differences between a calculation engagement and a valuation engagement within a marital dissolution context, and explains the business valuation standards and requirements associated with each engagement. Also discussed is the assessment of projections that may be used in a discounted cash flow analysis in a calculation engagement.